RPC-122-1, RPC-122-2, RPC-122-3 and RPC-122-4 in their containment chamber. Containment Protocols: RPC-122 is to be contained in a 15x15 meter containment chamber with weekly maintenance to ensure the state of RPC-122 does not alter. If RPC-122's state alters, location is to be changed and Protocol-122-Alpha enacted1 to prevent more incidents occurring. Upon the conclusion of an experiment, Protocol-122-Alpha is to be enacted by a security staff member to halt anomalous effects. No experimentation on living beings is to be done on RPC-122 by any means. Personnel caught experimenting RPC-122 on living beings will receive severe punishment and coercion measures. Description: RPC-122 consists of four white wooden dice that date back to 1844. RPC-122 does not exhibit its anomalous effects until all instances cumulatively represent their original summed value of 12. Experiments have been conducted to investigate how such a value could be achieved. It is yet not clear if different patterns cause any different reaction in the anomalous effects of RPC-122. RPC-122 represents a number of different reality-altering anomalous effects that seem to be random at times. 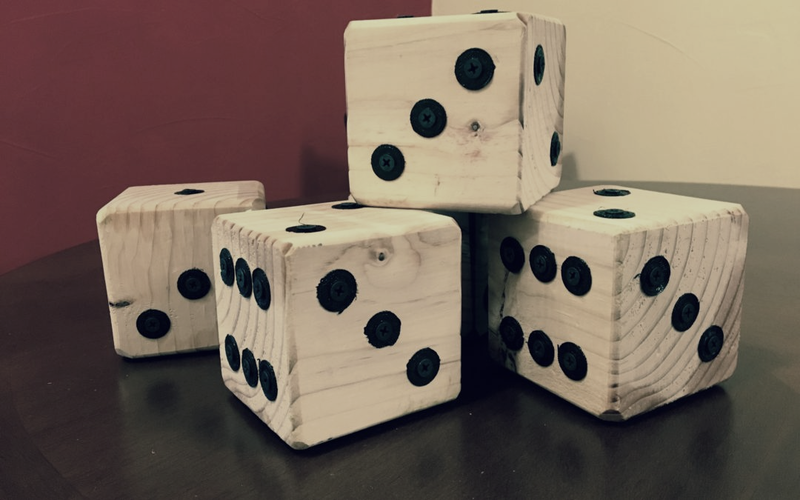 Upon anomalous effect triggering, any object or surface below the dice receive the anomalous effects until an estimated range of 5 meters. RPC-122 is completely safe for testing on live beings and represents no danger to humanity. In fact, its effects may not trigger at all in human beings. There have been three tests conducted on this matter to demonstrate such effects. Following RPC-122-Incident-1, RPC-122 has been proven to be capable of lethal effects. There is no current method of predicting how fatal effects are triggered. Recovery Log: RPC-122 was recovered from a closed factory by MST-██████ in Moscow. Despite the factory being rendered inoperable since 18██, it was observed to be releasing yellow smoke from its chimneys after a blizzard had occurred in the area. On February ██th ████, Senior Researcher █████ conducted an experiment on RPC-122. The experiment consisted of █ CSDs trying different patterns with each RPC-122 instance until it exhibited its anomalous effects. The CSDs were not informed about the total sum value required for RPC-122's anomalous effects to initiate. Upon triggering, both CSDs suddenly ██████ and [DATA EXPUNGED]. ASF Operative-███ was dispatched to the CC to follow Protocol-122-Alpha. Once the protocol was concluded, █████ and MST-██████ was sent to [REDACTED]. Following this incident, testing on living beings has been forbidden. During the following Experiments, each instance was set to follow a specific pattern by a CSD. Procedure: The four dice were placed on top of a wooden table and their pattern was changed. Pairing was random. Change: Wooden table converted into a metal table. Material appears to be Iron. Procedure: The four dice were rolled inside a red carpet until their sum equaled 12. Change: Carpet became yellow and sparkly. Procedure: The four dice were carefully stacked next to a window brought inside the Containment Cell. Change: Glass became bullet proof and bright red. No known color tint could be found on the glass. Procedure: The four dice were placed inside a glass cup. Change: Glass cup begun melting. Temperatures estimated to be around 5000º celcius. Procedure: A wool ball was placed next to the kitten to entertain it. Following this, the four dice were placed in the pattern requested by the researcher next to the kitten. Change: Kitten became a Scottish Fold adult cat. Procedure: The CSD was requested to place two dice on his left hand and the remaining ones in his right hand. After placed, their patterns were adjusted. Change: CSD gained 10 IQ points. Procedure: The CSD was requested to place two dice next to her left hand and the remaining ones in her right hand. After placed, their patterns were adjusted. 1. Protocol-122-Alpha is the routine of safely placing each RPC-122 instance to the pattern 1, 1, 1, 1 to halt anomalous effects. All instances are to be placed next to each other in a linear arrangement to ensure ease of maintenance.